Skied a couple of nice runs on a beautiful, sunny, not-too-warm Sunday afternoon: Paradise Glacier and the lower portion of the Cowlitz Glacier, both of which still had nice snow conditions, well-consolidated corn with some incipient suncups. Panoramic view of the Paradise Glacier from the west flank of Cowlitz Rocks (digitally stitched from 2 photos). Dave Coleman, Ashlie, and I started from 4th Crossing trailhead on the Paradise Valley Road (5200 ft) at 11:30am, hiked the extremely muddy trail to join the much nicer Skyline Trail, and switched to skinning right at the Stevens-Van Trump Monument (6050 ft), only 0.7 miles from the trailhead. Continuous snow still from here all the way to the top of the Paradise Glacier, although careful route finding is needed to avoid having to cross bare rock (start by skinning straight ahead towards a waterfall, not along the trail). A couple areas may melt out soon, namely near that waterfall and also near 7000 ft on the steep face below Paradise Glacier, just above the now-deglaciated basin which until 2003 held the remnants of the lower Paradise Glacier. I split from the other two, who wanted a more leisurely day, passed a party of three skiers lunching at 7000 ft (DonB et al), and skinned up the mostly smooth, lightly-suncupped glacier. A few crevasses are opening up, but easily avoided and not appearing to be hazardous yet. Ran into Tom and Dodge skiing down the glacier, who told me RonJ, Jeanette, and Bonnie were also skiing in the vicinity. Continued to 9000 ft, just above and left of the bergschrund below Anvil Rock, and stopped right at the edge of where the suncups finally grew to huge size. My faintly-visible ski tracks on the upper Paradise Glacier. Skied a nice run back down the glacier at 3pm, and considered dropping sight-unseen off the steep eastward roll below 7600 ft to reach the lower Cowlitz Glacier, but decided it was too risky being solo and not knowing whether crevasses or exposed glacial ice or cliffs lay below. There's a much safer alternate way to get there, far less direct but with no unknown hazards. So I skied back down the steep south face I had ascended, then skinned from 6700 ft back up to the 7100 ft saddle just north of Cowlitz Rocks. This is a spectacular spot, with a magnificent view of the twin icefalls of the Cowlitz and Ingraham Glaciers just above their junction. The saddle itself is melted out, so about 50 vertical ft of bare rock and sand must be climbed to reach snow on the other side. Dave and Ashlie were sunning here on the rocks, enjoying the view. 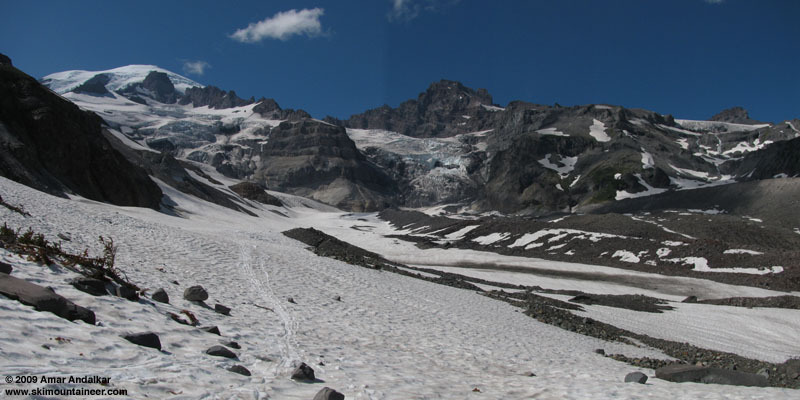 Panoramic view of the Cowlitz Glacier and its icefall from the north flank of Cowlitz Rocks, with Little Tahoma and the lower icefall of the Ingraham Glacier at right (digitally stitched from 2 photos). Climbed up to the top of the snow on the other side, about 7150 ft, and skied down the NE-facing slope towards the junction of the Cowlitz and Ingraham Glaciers. Slightly rougher snow than the Paradise, more suncupped (which was surprising given its NE aspect), but still pretty good and nicely softened by mid-afternoon. Followed five sets of ski tracks (from the above-named suspects) all the way down to edge of the glacier near 6400 ft and then along its right edge, schussing down the gentle slopes towards its terminus. A few incipient crevasses were visible where the glacier flows past a large rocky cliff near 6300 ft, but mostly crevasse-free and easy if slightly-sticky skiing. I expected the five skiers to be skinning up towards me at any time, but instead at 5500 ft near the glacier's terminus, their tracks switching to booting and headed upward and south, exiting the glacial trough to points unknown. The largely rock-covered terminus of the conjoined Cowlitz and Ingraham Glaciers, looking SE from near 5500 ft with Margaret Falls at left. I needed to rejoin Dave and Ashlie, so I turned 180 and skinned back up my mostly straight-line ski track, savoring the cathedral-like quality of this stunning location, a valley glacier surrounded by towering cliffs, numerous waterfalls, and two massive icefalls straight ahead. Panoramic view from 5500 ft of the lower Cowlitz Glacier at left, with Little Tahoma and the lower icefall of the Ingraham Glacier at center and the terminus of the Whitman Glacier at upper right (digitally stitched from 2 photos). Skinned all the way back up to the saddle just after 5pm, then rejoined Dave and Ashlie for a quick run from the west face of Cowlitz Rocks near 7300 ft. We skied all the way out from there, albeit with a few very slow traversing sections, back to the Stevens-Van Trump Monument. Ran into Tom and Dodge again on the last bit after their return from the Cowlitz terminus, and saw RonJ and the other two on a distant ridgetop, still returning from there via a longer route. Hiked back down the trail to the car just after 7pm (no bugs down here all day BTW), and soon we were enjoying much-needed burgers at the Copper Creek Inn. Skiing back down the west flank of Cowlitz Rocks towards the Paradise Glacier. A nice day out on the flanks of the Mountain, which ended up much bigger for me than I had planned. About 6100 ft of ascent for 5200 vert of fine July skiing in pretty nice snow conditions. What a forecast: the most stable period of high pressure since January, and the highest freezing levels thus far this year! SYNOPSIS...A DEVELOPING RIDGE OF HIGH PRESSURE AT THE SURFACE AND ALOFT OVER THE OFFSHORE WATERS WILL GRADUALLY BUILD INTO WESTERN WASHINGTON MONDAY. TEMPERATURES WILL WARM TO WELL ABOVE NORMAL TUESDAY INTO WEDNESDAY. TEMPERATURES WILL COOL SOMEWHAT TOWARD THE END OF THE WEAK AS AN UPPER LEVEL LOW MOVES ACROSS THE AREA. HIGH PRESSURE ALOFT WILL REBOUND NEAR WESTERN WASHINGTON NEXT WEEKEND AND MAY RESULT IN NEAR RECORD HIGH TEMPERATURES. SUNDAY...MOSTLY SUNNY. FREEZING LEVEL 14500 FEET. SUNDAY NIGHT...MOSTLY CLEAR. FREEZING LEVEL 14500 FEET. MONDAY THROUGH TUESDAY...MOSTLY CLEAR. FREEZING LEVEL ABOVE 15000 FEET. TUESDAY NIGHT THROUGH SATURDAY...MOSTLY CLEAR. FREEZING LEVEL NEAR 15000 FEET. Nice photos, Amar!� You've let the feline out of the sack about the big mellow to the east of the Muir conga line.� � �� Along with persistant summer skiing, the snow quality in this lee region is often better than the snowfield in mid-winter.� The ice coverage is definitely much smaller than the maps show.� �The two icefalls and the lower Cowlitz look alarmingly thin. Your fifth photo from the lower Cowlitz brought back the day in the late 70's RMI's Andy Politz pushed me almost to Box Canyon via 'Moon Rocks'.� �The terminus then had a huge ice cave and was near where the river turns south now.� He was training for Everest; I think we both had metal-edged wooden XC skis, low-cut boots, and new skins made by cutting a Euro pair lengthwise.� We returned by climbing near the present terminus past Fan Lake and looping around Cowlitz Rock.� Beautiful tour, especially the falls.� Long day, but not as much vertical as your, as usual, fine TR. What? Who said anything about me wanting a leasurely day? I'm just perfecting the 2009 arm chair ski mountaineering position. That's alot of dust on those skis. Nice report Amar. You nailed it with the conditions, elevations, and landmarks. While we were sitting up at the saddle we watched/heard four or five chunks break off the Ingraham icefall and come crashing down. Pretty spectacular and yes, Gary, it was thinning fast. Thanks for the report.